This "Drop In" Kit has been in existence since 2001. It is PROVEN Kit that WILL deliver the performance claimed. There are not "set-up" concerns, no reliability concerns. After more than 10 years running, ALL variables are KNOWN! It is a TRUE "Pull the Rope and Go" Bolt On Performance Kit!! NOTE: This "Drop In" Kit has been in existence since 2001. It is PROVEN Kit that WILL deliver the performance claimed. There are not "set-up" concerns, no reliability concerns. After more than 10 years running, ALL variables are KNOWN! It is a TRUE "Pull the Rope and Go" Bolt On Performance Kit!! You WILL be VERY pleased with this Kit! IF you have NOT read the tech article on the reason behind the power problems of the Rotax 800 Twin Engine HERE (clicky) PLEASE, take a little time to read it so that you can have a better understanding of what is REALLY happening inside this engine. OK, Now, that you have a good understanding of the problems associated with the 800 Series III engine.... Let's look at a few solutions to what plagues this awesome power-plant!! RK Tek has several over-bore options for this engine. Each over-bore utilizes custom pistons . These pistons are custom machined by RK Tek to change a few parameters of the piston geometry that allow for more reliability and power!! While the over-bore option does add EXCELLENT power, it is a bit expensive due to the cost of cylinder boring and re-plating. These big bores are great kits but are a bit pricey for some. SOLUTION-->> RK Tek has developed an 82mm (Stock Bore) CUSTOM piston for the Rotax 800 Engine. This piston is the same piston used in our big bore kits but it is machined to drop in the Stock cylinders. We have tailored this piston to add maximum power and reliability at the stock bore dimension. Because of the unique geometry of this piston, the engine can achieve power levels that were "unheard of " before the release of this piston. 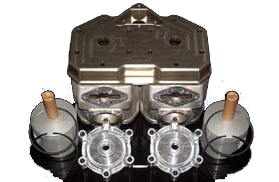 These pistons require a custom head (pump gas-->combustion chamber), MPEM re-curve and base gasket in order to reach the 160HP(STOCK HO cylinders) mark. This piston and head kit can be used with ANY year 800 Twin Series III Engine (2001-2007). If you just "drop-in" this kit with no cylinder porting... the HO cylinders will produce a bit more power than the non-HO cylinders but the improvement is SUBSTANTIAL!! The power-fade and ring flaking problems VANISH!! with this kit. For those who wish more from their engine, we offer a solid porting package to accompany this piston kit. The custom CNC porting will add another 6-9HP to the HO cylinders and 10-13HP to the Non-HO cylinders. This allows for an EASY, Bolt-On, power package that keeps you legal in most sanctioned events. For those who do not care about being legal in sanctioned events, we have the Big Bore options. OK, What is the cost of this kit?? NOT BAD! To FINALLY make your 800 Run right! PLEASE! Give us a call if you have any questions! !